From August 5 to August 21, most of the sports world’s attention will turn to Rio de Janeiro, Brazil, for the 2016 Summer Olympics. At their idyllic best, the Olympics are a showcase of the unifying power of sports. Athletes from just about any country you can name — men and women, young and old, rich and poor, Black and White and all colors in between — gather in one place to put their differences aside and compete on a level playing field. But there are still some citizens of this world whose limitations, location or lifestyle keeps them on the outside, looking in. Muslim women who wear the hijab — a headscarf or other form of clothing that covers parts of the body in the name of modesty — are not absent from the wide world of sports, but they are uncommon. That is due in part to the governing bodies of some sports outlawing the hijab. Most famously, the international basketball governing body FIBA has a rule on its books (currently under review) that prohibits headgear on the court such as Muslim hijabs, Jewish yarmulkes and Sikh turbans. The FIBA anti-hijab rule has kept some Muslim-majority countries from sending women’s basketball teams to international competitions like the Olympics and the World Championships. It has essentially ended (or halted) the careers of some Muslim basketball players who are talented enough to play professionally in FIBA-sanctioned leagues. While FIBA appears to be slowly getting its act together, other sports like soccer, weightlifting, and track and field have in recent years eliminated or chosen not to enforce similar anti-hijab rules. That has opened doors for many Muslim women who no longer have to make a choice between religious expression and athletic competition. Once they have cleared the hurdle of simply being allowed to compete while wearing the hijab, the next step for Muslim female athletes is finding the hijab that will not hinder their performance. That’s where Ruqsana Begum enters the picture. The 32-year-old kickboxer and Muay Thai fighter from England recently launched her own line of sports hijabs. 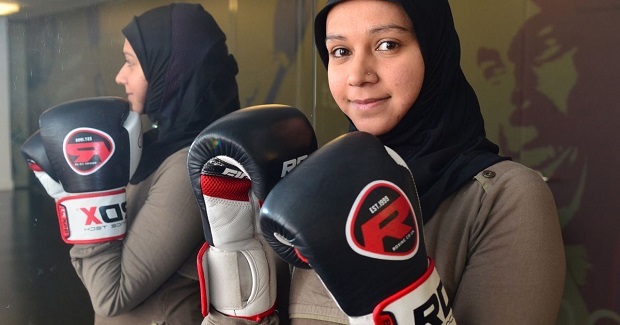 Begum, a practicing Muslim, currently holds the British atom-weight Muay Thai championship and is captain of Great Britain’s Muay Thai national team. She is a former bronze medalist at the World Amateur Kickboxing Championships. Leading up to the 2012 Summer Olympics in London, Begum was selected as one of the Olympic torchbearers. While Begum doesn’t wear the hijab, she says she sympathizes with her Muslim sisters who choose to cover while competing. 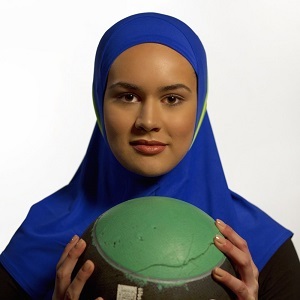 Begum’s sports hijabs are made out of Lycra, a breathable fabric popular with sports apparel brands, and they don’t require a safety pin to hold together. The sports hijab fabric stretches and is designed to not come loose during competition — whether it’s in the ring, on the track, on the court or on the field. Begum’s line of sports hijabs are not the first of their kind, but they are believed to be the first made by a Muslim designer who is also an athlete.